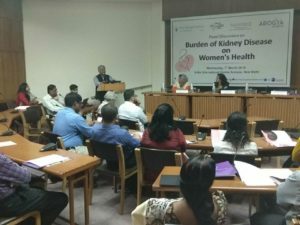 In anticipation of both World Kidney Day and International Women’s Day tomorrow, Arogya World participated in a the Kidneys and Women’s Health Round Table hosted by The George Institute for Global Health in New Delhi in collaboration with Taskforce on Women & NCDs and the International Society of Nephrology. Chronic kidney disease affects about 195 million women worldwide and is currently the 8th leading cause of death, with close to 600,000 female deaths each year. We took this opportunity to highlight the importance of women’s health and, particularly, their kidney health. One of the highlights of today’s event was the launch of a joint statement by these organizations calling world leaders to address kidney health in women. Our CEO Nalini Saligram joined health leaders to present this joint statement, which collates key evidence on the burden of kidney disease in women, identifies ways in which kidney health most significantly impacts women’s health, and makes recommendations on how these may be addressed through targeted health policies. The agenda from today’s roundtable discussion can be viewed here.